The Community Center Auditorium continues to be the City of Chaska's tradition of high quality facilities. The space is capable of seating 240 spectators and includes an orchestra pit for full musical productions, a sound and light booth, professional stage rigging for curtains and sets and a sound system. Perfect for plays, musicals, and recitals! Sound, lights, and professional stage rigging and an orchestra pit for full musical productions are available for use. The Community Center Gallery space is richly appointed colonnade that serves as a pre and post function theater space equipped with track lighting for the exhibition of artwork and sculpture. 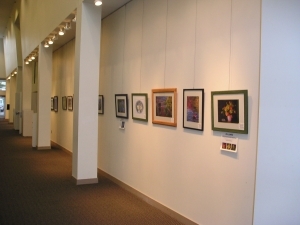 Visit the Art Gallery page to see what events are coming up.